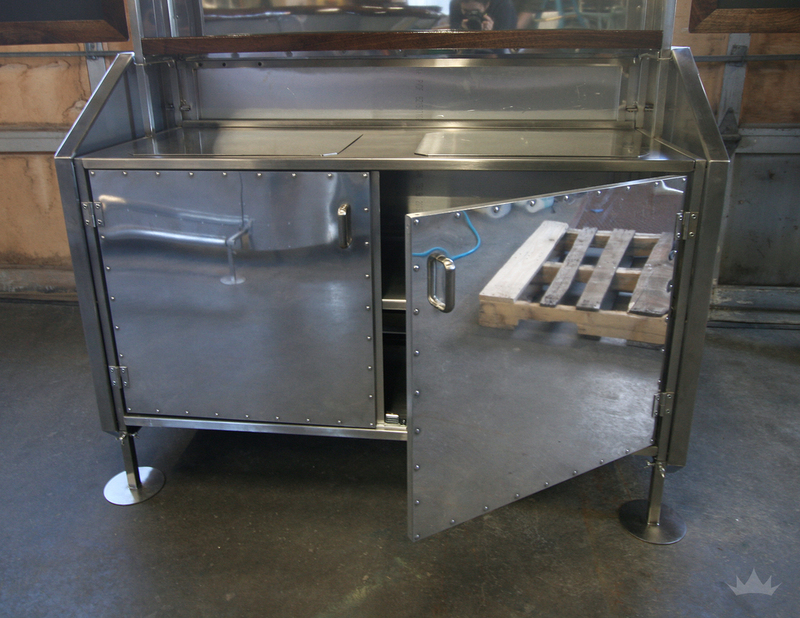 Using a vintage Bambi bar car as inspiration, we overhauled a portable bar system with aluminum and rivets. This mobile unit can be broken into manageable pieces that allow a it to be set up and broken down at an event. It features stainless steel work surfaces and locally sourced wood elements. The highly polished aluminum exterior takes inspiration from classic Airstream travel trailers. This bar cart, and its Bar Car counterpart, can be rented for events in the San Francisco Bay area via their site: www.barcarsf.com. 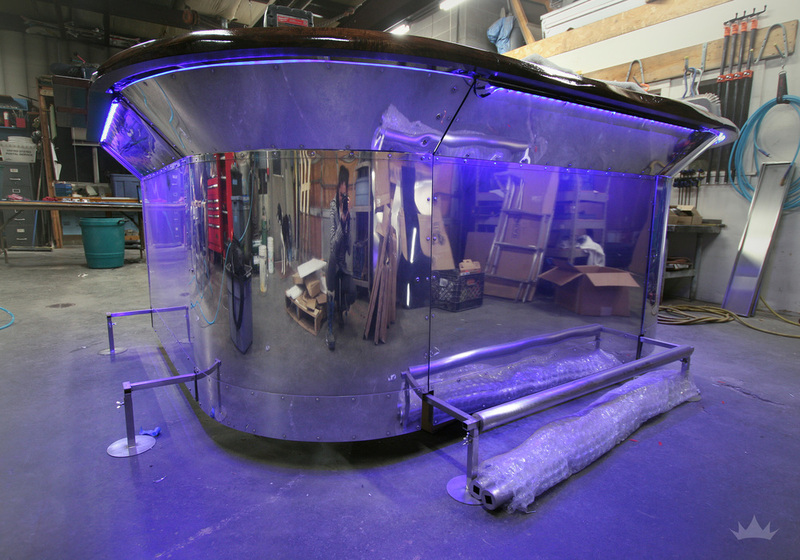 We were thrilled when a past client, SF Bar Car, sought us out to outfit a portable bar for them. The goal was to take an already developed flash bar system and modify it to match the client's existing Bambi Mobile Bar (aka Bar Car). We needed to include a back bar unit, close of storage space, and create menus that could all be broken down like the rest of the unit. Now the company has the ability to send bars out to multiple events, with venues that are indoors or outside. Since Bar Car's identity is heavily built around a travel trailer, by carrying over well known details from Airstream design we were able to keep the brand cohesive. We covered the stainless frame with Aluminum panels and detailing. 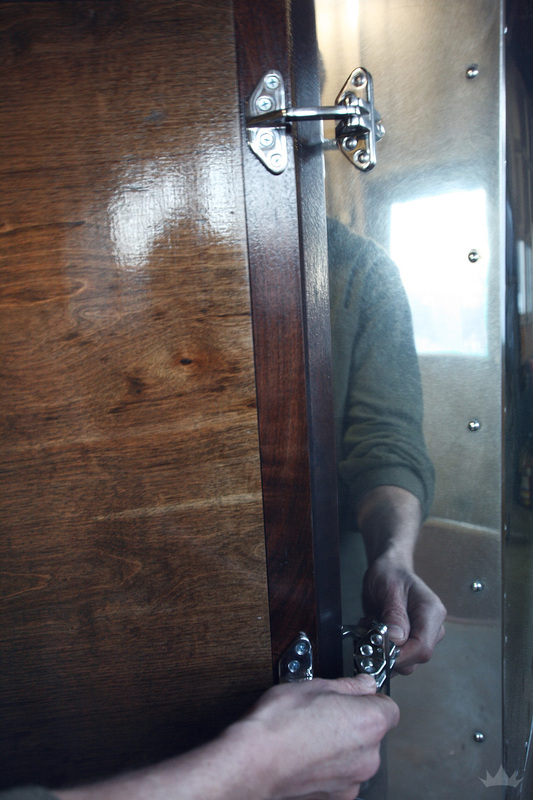 Rivets were used to mimic the patterns found all over an Airstream. 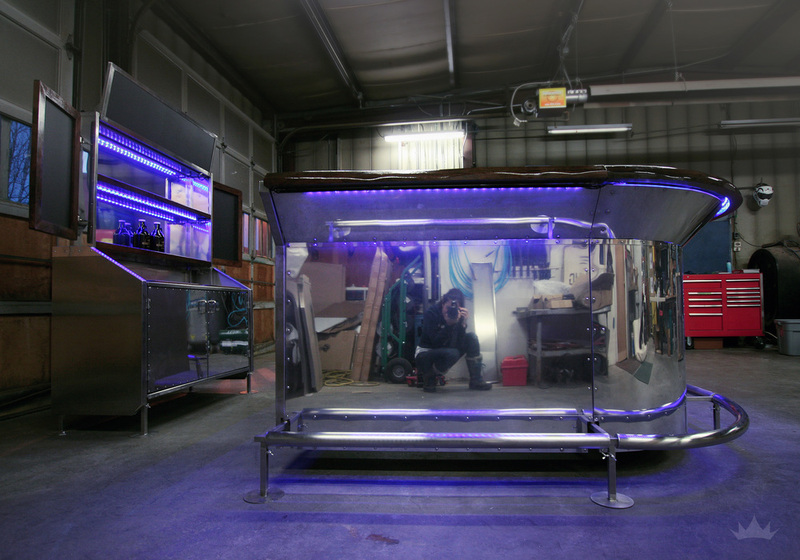 We used LEDs to light up the unit, matching the ones used on the Bar Car to give it a bright under glow. 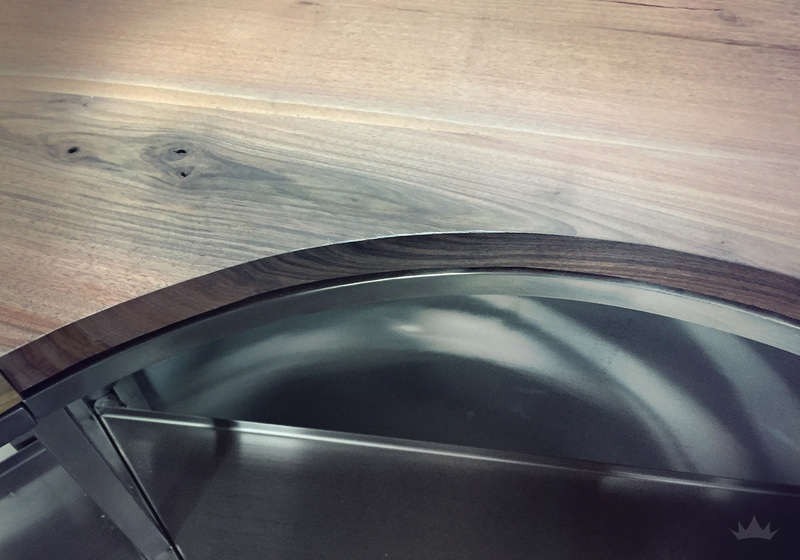 The wood elements were stained to match the dark wood of the Airstreams fold out bar and interior shelving. 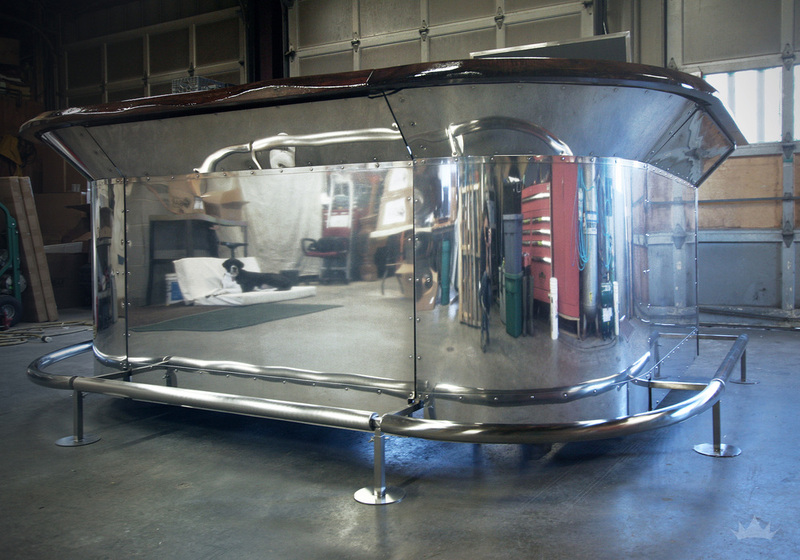 The existing curved corners of the bar further drove home the classic Airstream look. • SEGMENTS: 3 Straight, 2 Corners, 1 Back Bar. 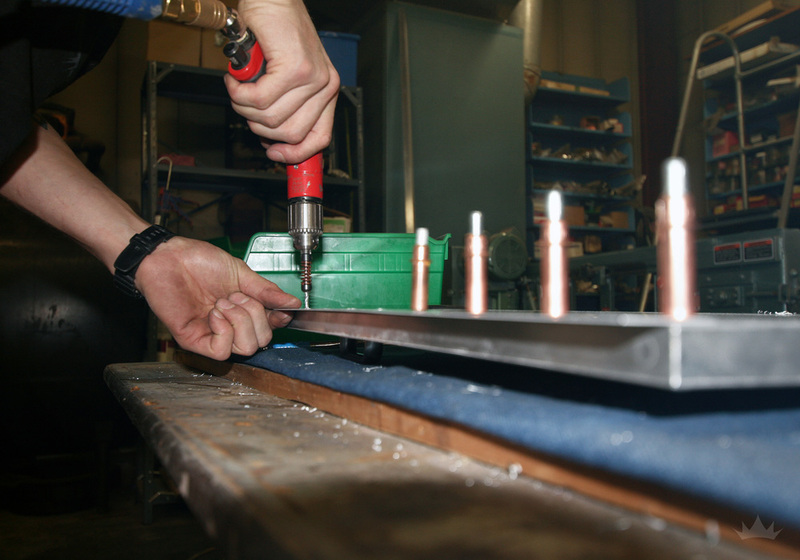 • SPEED RAILS: 3, one for each straight segment. • ICE BINS: 3 Stainless Ice Bins with Lid. • USERS NEEDED TO BUILD/BREAK DOWN: 1 - 2 People. 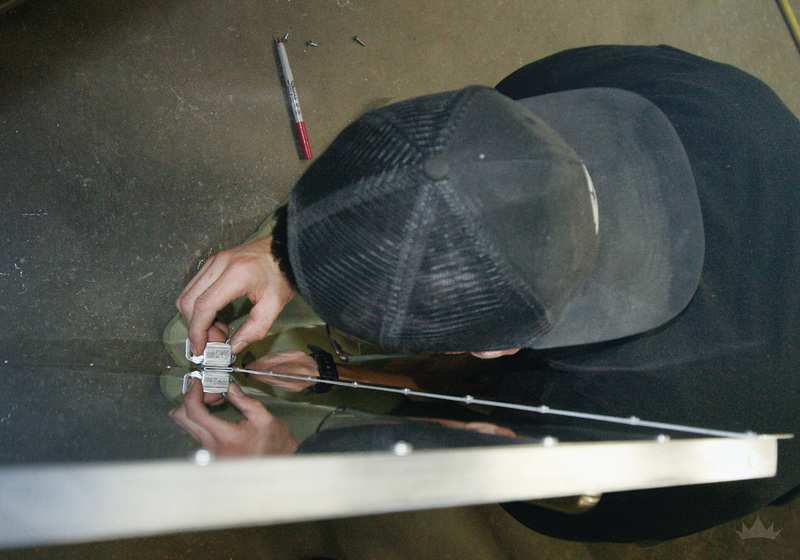 ✓ PANELS: Replaced all panels with polished, riveted Aluminum. ✓ BAR TOPS: Locally sourced Black Walnut. ✓ LIGHTING: Color Changing LEDs with remotes. ✓ ICE BINS: Includes additional Ice Bins with custom stainless caps to create more surface area, and custom Walnut cutting board options. ✓ PANELS: Polished Aluminum paneling with rivets to match. ✓ MENUS: (2) Black Walnut framed chalkboard menus for sides of the back bar. (1) Custom chalkboard insert for the upper sign holder. ✓ DOORS: Matching Aluminum doors that drop in. Closing in lower part of back bar. Hiding additional storage and ice bins from view. Working with a talented company who manufactures this bar system was a lot of fun. Check out some behind the scenes shots as we transformed it aesthetically. 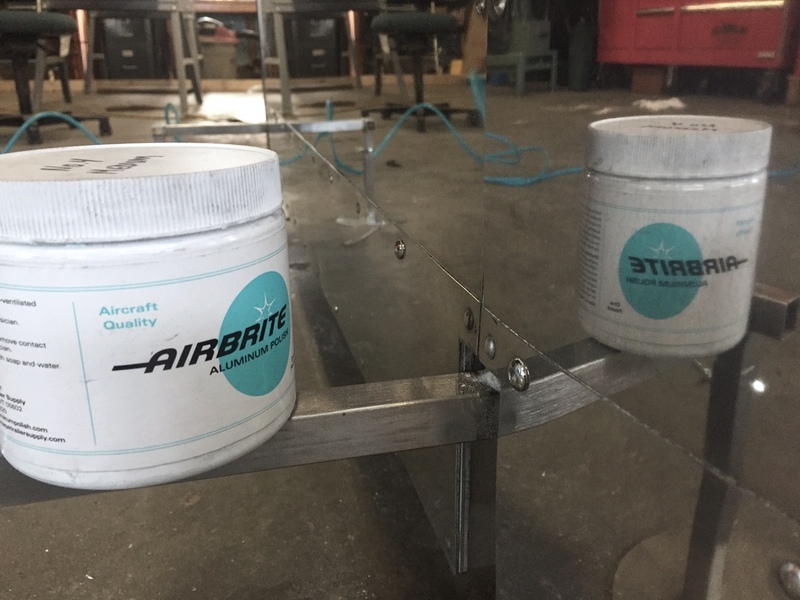 If you are interested in taking a deeper look into the process, check its section of our Shop Log. To follow along with current projects as they happen, visit us on Facebook or Instagram.